I don’t usually do two ‘Best Of’ awards for the same place back to back, but this one so naturally followed last week’s that it made sense to put them together. Most resorts have the classic white plastic lounge chairs. The good resort will throw in a cushion to make it more comfortable. But no seating compares with the luxurious, giant comfort settees offered by the Holiday Inn Male at its rooftop pool deck. These lounges are like pool king-size beds with luxurious mattresses and headboard cushions. Really more like ‘pool beds’. The pool itself is a delightful infinity pool with a lovely wall fountain at one end. Poolside indolent luxury. 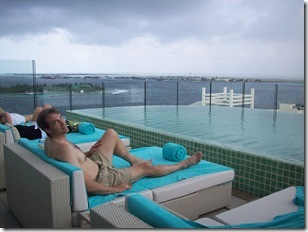 At 13 floors up, the Azure restaurant (and pool) of the Holiday Inn Male is the best hotel view in the Maldives. I counted 17 islands visible from this elevated perch not to mention the many toings and froing of boats in the harbour and the surrounding environs. Normally, I would hesitate to include Male hotels as ‘resorts’. It has no beach, no alcohol (Male is ‘dry’ while the resort islands are granted special licenses). However, I do have the Nasandhura in Male as well as the Hulhule resort on Hulhule island which is more like Male in characteristics than a dedicated resort island. Also, I suspect that a number of Holiday Inn ‘Priority Club’ member maybe interested in exploiting their points as a vehicle for getting to the Maldives. The Azure restaurant shown here just opened the 15 October and features absolutely delicious fusion (French/Japanese) dishes. If you are looking for a ‘room with a view’ in the Maldives, Holiday Inn Male is the highest and furthest. On 15 January 2010, an annular eclipse will be visible from a 300-km-wide track that traverses central Africa, the Indian Ocean and eastern Asia. Several resorts will be in the shadows path (follow the handy Google map plotting the course above), but Huvafen Fushi is the one resort where the centre passes directly over the island. An annular solar eclipse does complete cover the sun with the moon, but it takes place where the moon is too far from the Earth to completely cover the sun’s disk. That leaves a blazing “ring of fire” shining around the moon as it passes in front of the sun from Earth’s perspective. It is not quite as dramatic as a ‘total eclipse’, but quite a dramatic celestial event nonetheless. The GIF (click on graphic to see animated version) above shows last year’s annular eclipse in the Maldives that was 93% annularity. This year, the instant of greatest eclipse occurs at 07:06:33 UT when the eclipse magnitude will reach 0.9190. At this instant, the duration of annularity is 11 minutes 8 seconds, the path width is 333 kilometers and the Sun is 66° above the flat horizon formed by the open ocean. On dramatic point is that such a long annular duration will not be exceeded for over 1000 years (3043 Dec 23). The timing in January is one of the driest periods of the year which helps to ensure an unobstructed view. Lots of people go to Maldives for the sun, and here is a chance to go for a ‘sun event’. One of my tasks when I visited Kurumba last week was to get a boat and circumnavigate the island taking pictures to create a Maldives Photosynth. Thanks to the kind assistance of Andreas Ronecker of the Unlimited Watersports centre there, I got a full set of photos. Unfortunately, being my first go at a Photosynth, my ‘synth’ didn’t turn out as great as I would have liked. I didn’t get enough pictures for the calculation engine to map and model the island effectively. My ‘synthy’ measure was a low 12% so not many of the picture groups joined into a whole. Though you can take the tour around the ocean perimeter of the island using the ‘slide show’ function. 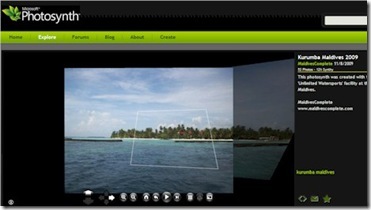 Not too worry, Maldive resorts are becoming more and more popular subjects for Photosynth and the Microsoft gallery now has 32 uploaded. Photosynth is sort of more than a 360 degree virtual tour. Because it builds a 3D model of the subject, you can really explore and get a sense of dimension and scale. Given my experience and investigation into Maldives resorts, people often ask me ‘which one is my favourite?’ It is a bit like asking which of your children are your favourites. They are all great in their own distinct way. But it is their ‘own distinct ways’, many of which are highlighted by MaldiveComplete’s ‘Best Of’ posts, that either turn on or turn off people. Some people like a big island, other like small. Some like lots of activities, others like peaceful tranquillity. Some like family catering, others like to avoid children for the stay. That is why it is important to know what is important to you and then select for those key features. This is why two off the key features of MaldivesComplete is a (a) database filter/search facility (‘Resort Search’), and (b) this very own ‘Best Of’ highlights. But sometimes decisions are a tough thing. Especially if you your preferences vary or if you are in a diverse group. In that case, what you might want it lots of choices. Kind of like an American cake mix aisle. After having stayed there last week and cross referenced a few data points, I am convinced that if ‘choice’ is what you want, then Kurumba offers the widest, deepest set of resort ‘choice’ in the Maldives. Two upcoming ‘Best Of’ awards for Kurumba are ‘Most Room Types’ (7…and that’s without having any water bungalows), and ‘Most Dining Choices’ (10…seafood, Japanese, Chinese, Italian, Arab/Lebanese, Indian, buffet, coffee hours and two bars). And if 10 isn’t enough for you, then you have easy access to Male where a whole host of further offering await you (I especially recommend the Holiday Inn Male rooftop Azure restaurant, but there are a range of ethnic eateries as well as a range of very good Maldivian restaraunts featuring local fare). 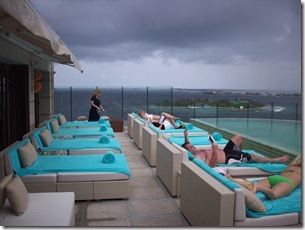 Kurumba also has 3 pools, 3 tennis courts, 2 gyms when most resorts will typically have one. Finally, the water sports centre features everything imaginable (including ‘pedal surf’ and soon a ‘sup’). As I said in my ‘Kurumba Wrap Up’ post, I think groups (extended families, corporate team/groups) would work well at Kurumba because there is such a range of offerings and choices that there is something satisfying for everyone. Some of the more boutique resorts in the Maldives are amazing in certain special ways, but sometimes those ‘ways’ are not everyone’s cup of tea. 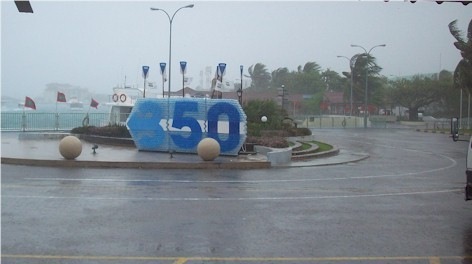 As we transferred to the Male airport for our departure, the Maldives hit us with everything it had left in its rain/wind/storm system as a final inclement send off. While it certainly made saying good-bye easier, we reflected (as noted in my ‘Stormy Weather’ post) how little it had ruined the vacation. We had just about come to terms with these plusses and minuses until our final day when we woke up to what seemed to be National Monsoon Day. Scores of splashy downpours paraded by one after the other each one trying to outdo the previous one. The umbrella was pretty useless because the rain hit the ground so hard that it bounced up and attacked you from underneath. Still, when the weather broke a little we still went out for a family snorkel. The weather acted up a bit and it was a bit funny snorkelling in a monsoon but ‘under the sea’ everything was calm and we saw this giant stingray digging for food in the lagoon. Enjoy each other’s company – The trip for us was a long overdue family get together and being together, playing board games, joking around, was half the fun that the weather didn’t touch. I think if your fellow travellers were not your favourite people, the time in the confined space would be a bit less fun. Not sunbathers – Many people do come to the tropics for lounging in the sun and working on that tan. If that is a key objective to the holiday, then there is not much solace to be had in missing sun (no pun intended…oh well, maybe a bit). Undaunted – Many would have hunkered down with even just the regular threat of wind and rain, but we boldly went out on activities like snorkelling and visiting Male and they all worked out fine if not as spectacular as a sun-drenched day would have been. 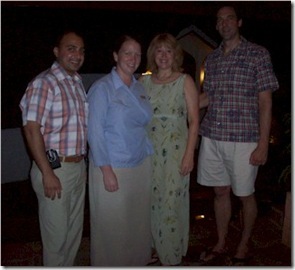 Upbeat Attitude – Every one was pretty upbeat constantly. Appreciating the many upsides and savouring the delightful experiences and striking beauty that takes more than a little rain to dissolve. The forecast early in the week was right and we had rain every day. While the rain came down in torrents, it only lasted 20 minutes or so. The downer was not the rain but the clouds. As stated previously, the lack of sun seemed to mute the Maldives experience and take away its sparkle. It was a lovely holiday, but not idyllic. It had its silver linings (easier reading, more mild temperatures), but more downsides (no sunbathing, less dazzling, less visibility and warmth snorkelling). It just goes to show you that even in ugly weather, the Maldives is beautiful. The major impact of unkind weather is that instead of the Maldives being ‘wow’, they were only ‘wonderful’, instead of being ‘exhilarating’, they are only ‘excellent’. Well, we say goodbye to our now beloved Maldives and our new dear friend, Kurumba. I started the week with a ‘first impressions’ post and thought that I would finish with a wrap up review. As the week went on I certainly began to appreciate more and more about the resort, though a few things did start to irritate me. The irritations first. I’ve already mentioned in my ‘Meal Plan’ post my frustrations with dining locations so I won’t belabour that point. 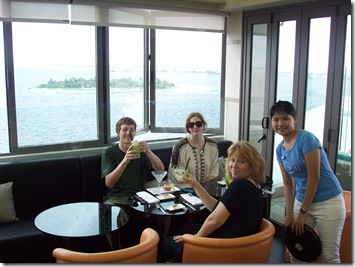 One of our favourite locations was the ocean side bar. Great room, drinks, service. The only thing to fault it was the tiresome and repetitive muzac. Our kids played a game to bet when the next playing of Kanye West’s ‘American Boy’ was coming around again. Seriously, for a place this classy, it deserves classy music to set the atmosphere (they had a live band mid week which was excellent actually). I recommend something simple and acoustic like a gentle jazz piano or Spanish acoustic guitar. Now, the extra good stuff. First and foremost has to be the extra good staff (two of which are Operations Manager Ankush and Guest Relations Eilidh in the photo above) . And the Maldives generally has a superior standard of service anyway. Certainly, everyone was very friendly and attentive. 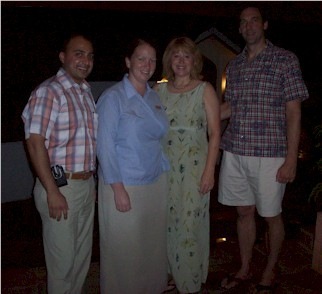 In fact, we met a couple from Wales who had been to Kurumba several times and always come back because they are convinced that the resort has the best staff in the Maldives. That is a pretty tall and subjective claim, but I have no specific argument against it. But above and the call of duty examples included Myat Su who lent us her personal memory stick to help us fix a computer problem. The games they have stocked for use included Scrabble and Chinese Checkers (two of our family favourites) that were a real godsend (and directly boosted bar sales for two nights). Also deserving of special mention is the landscaping. The more time I spent and explored, the more I appreciated the landscaping. Really impeccable and colourful. I liked that the foliage between the beach villas and the water was just enough to provide colour, shade and visual interest, but not so dense as to actually obstruct the view (a problem that I often bemoan with other resorts). They even have a nursery where they cultivate tons of orchids and other flowers for use on the resort that you can go into an explore. Also, the design feature of the numerous, rectangular pools was a lovely touch. Finally, the Aquum spa was excellent. I am a bit of a Thai massage connoisseur and therapist Dinny executed several complex moves that I had never before had. Our daughter doesn’t dive so we treat her to a spa treatment instead and she reported that therapist Lyle gave one of the best massages that she had ever had. They also had very good spa music. All and all, I would highly recommend Kurumba without reservation as a value for money, top quality resort. 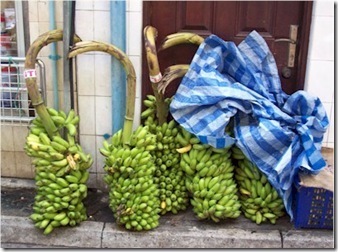 Be aware of the impact its proximity to Male and the prevalence of concrete walkways and dining areas has. A couple types of visitor that I think would find Kurumba especially appealing would be mobility constrained and larger groups. The concrete actually works in favour of people with mobility issues and Kurumba has ramp access nearly everywhere. Also, I think groups (extended families, corporate team/groups) would work well at Kurumba because there is such a range of offerings and choices that there is something satisfying for everyone. Some of the more boutique resorts in the Maldives are amazing in certain special ways, but sometimes those ‘ways’ are not everyone’s cup of tea. If you like lots of choice, great food, great service, great gardens, convenience to Male, then Kurumba could very well be a top choice for you. 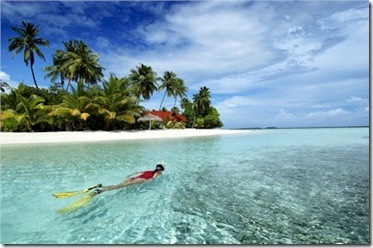 One of the commonly offered excursions by resorts in the general Male area is a trip to visit Male. Male is the heart of the nation with a third of its population. We always landed right next to Male, but never actually ventured into it. The planning of this trip was actually influenced by my desire to visit Male to do some research for MaldivesComplete and so the whole family decided to join in for a change of pace and to see this tiny, island capital. The family visited the National Museum (a small, unassuming place), the Islamic Center, the Friday Mosque (the oldest mosque in the Maldives made entirely out of coral), the Mulee Agee (presidential palace), the and the local fish/fruit market (see picture below). 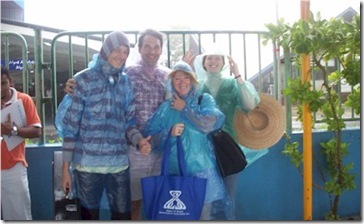 The whole guided excursion combined with some souvenir shopping took about 3 hours. And that was pretty much all there was to see in Male. It really provided a taste of the ‘real’ life of the Maldivians with the toing and froing of their national hub. 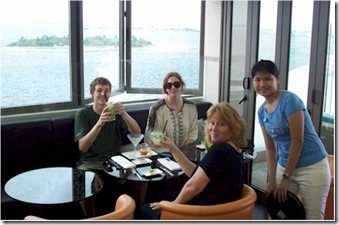 We then met up for lunch at the new (opened September 2009) Holiday Inn Male at their rooftop restaurant, Azure (see picture above). It was a real gem of stylish design, great views, brilliant fusion oriental cuisine at very reasonable prices and a number of other treats (‘Best Of’ blog posts coming soon on these). A number of people ask about visit and staying a Male. I think our visit was just right. Worth it if any of these activities appeal to you. If you wish to or want to spend a day there, I highly recommend the Holiday Inn. As mentioned, the restaurants are top notch, the rooftop infinity pool a treat and a handy spa also had fine treatments at competitive prices so plenty to fill one’s day. Not only did we do our whole trip DIY (buying resort, air travel, connections all separately), but we also opted for the a la carte meal plan (versus full or half board). 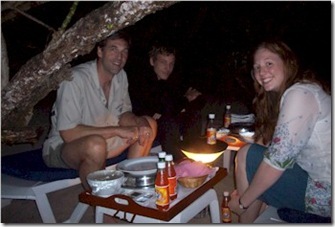 This decision of which meal plan is one of the most prominent in deciding a Maldives visit. We are happy with the a la carte for the following reasons. First, Kurumba has lots of restaurants (10) to choose from. Perhaps a smaller island would have less choice and restaurant options and this advantage would be less strong. Secondly, we prized flexibility whether we even ate. We had planned on going to Male for a day where we had lots of options to dine quite inexpensively so not having to pay for this day is an advantage. Also, 3 of our 4 strong party are watching their diet (and the 4th is not a big eater) and so several times we either skipped lunch after a big breakfast or felt like a small snack for dinner after a big lunch. So far this week, our decision has been by and large a good one. Kurumba offers a $50 (+10% service) half board supplement and a $80 (+10% service) full board supplement. If we had taken either of those, we probably would have saved some money on our total meal bill. But, our meals would have been confined wholly to the Vihamana restaurant with its themed buffet style eating. I checked out the buffet and the food looks diverse and delicious. But you are still stuck with the selection on offer that night rather than the whole range of the other 9 restaurants. Perhaps more of an issue is the dining location. This issue was particularly acute because all of the restaurants have tiled floors. We much prefer the sand floors so many resorts offer. Though natural floors are not everyone’s cup of tea, most people I speak to about the Maldives do prefer them and in fact find it one of the ‘wow’ factors. Also, all but one of the restaurants are quite removed from the water’s edge (and lovely ocean with its gently lapping water is a defining characteristic of the islands obviously). Going a la carte, we had more options to eat ‘where’ we wanted to. 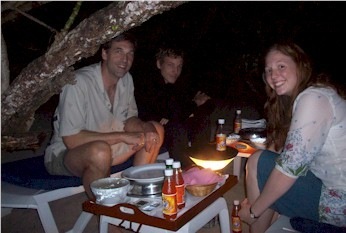 Some of our best meals were in special locations. The first was the beach side eating area by the pool. This spot is the best dining area on the island and yet they close it for dinner. Go figure. Probably my biggest beef with the resort is this issue. 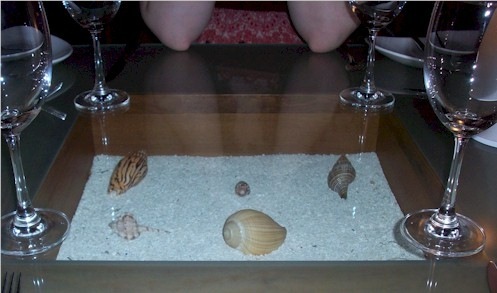 One way we managed a ‘beach dinner’ was to order room service. The room service menu is a rich selection of offerings from the various restaurants which when it arrived we simply took it outside to our beach chairs and tables to eat by the ocean and under the palm trees. It was the kind of exotic setting that we savour in the Maldives. We since found out that the resort rules say “Glass containers or any other breakable substances that shatter, are prohibited on the beach.” We didn’t bring any glass, but I guess the plates would officially be ‘breakable…that shatter’ (though hard to do on soft sand). I guess if you want to follow our lead for romantic beach side room service, you might want to bring some plastic or paper plates to move your meal to in order to abide by the rules strictly. Also, the food came in very generous portions. Halfway through the week we figured this out and made it a family rule that we could only order one portion (side or main) because that was almost always enough. If we have stuck to that approach, we would have saved more money early on and probably would have gotten our food bill down to the supplement costs for the standard service. 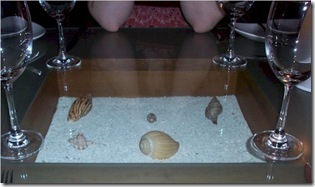 Still, we would have preferred our approach because our dining was more distinctive with more special settings. Some honeymoon friends adopted the strategy of sharing portions which also worked well to halve their food bill. Overall, the food was uniformly without fault and on many occasions truly distinctive. Of particular note were the soups (especially the gazpacho), sushi platter, and Black Bean Beef (Chinese). Food quality is a real plus at Kurumba and I hope they make some changes to make the eating locations just as special. PS. Love the tables at the Ocean Reef restaurant. We are thinking of making similar ones for our own dining room table we liked them so much. Best dive of my life. When life gives you lemons, make lemonade. 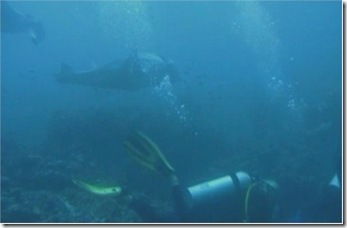 It was raining this morning so we cancelled our snorkel trip and went on a dive trip to Manta Point. Coincidentally, Manta Point was the last subject of this blog before my departure for Kurumba and so I was all geared up for brilliant possibilities. We had been there the day before, but I didn’t get to see mantas. Both our son and I had some minor problems with our equipment and decided to come up relatively early. My wife Lori stayed down and saw several. The other dive group with us said they saw three baby mantas which the dive master found humorous (“most Mantas are very graceful moving smoothly, but these babies were a bit uncoordinated and were flapping much more erratically obviously trying to find their sea wings…most amusing.”). So we decided to give it another go today and boy are we glad we did. About 15 minutes in, we rounded the corner and there coming straight at us was three of the most alien looking creatures you could ever see. It turned out to be a parade of large Mantas with some reaching 8 feet across. They turned and circled the coral outcropping which was one of their ‘cleaning stations’. Then for the next 15 minutes we just sat there while this group of majestic submarine airships floated, cavorted, did loops. They floated inches over our head. They seemed to be attracted to the air bubbles and I couldn’t help think that they liked how the bubbles felt on their freshly cleaned tummies. After all, this coral cropping was like a big Manta ‘spa’. Mantas come for miles around to have sucker fish clean their bodies. Maybe the scuba bubbles are a Jacuzzi-like bonus. They are the most peaceful and seemingly happy creatures I have ever encountered in the wild. Outstanding! The picture above is from a video taken by Kurumba photographer Mohamed Ibrahim (the diver at the right hand side of the screen at minute 1:09 is around my wife and diving buddy Lori).